Welcome to Sunday’s Dragon Duel! This is the third and final round, and the winner of this match will likely end this tournament in first place, earning their spot in the Dragon Duel Playoff later today. 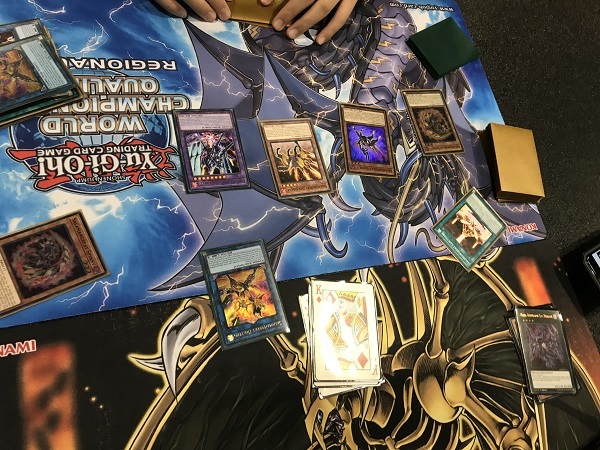 Kenta Lee is from Texas and has Salamangreat, a popular pick this weekend, while his opponent, Joshua Barton has a Phantom Knights Deck! It’s time to Duel! Lee won the roll and elected to go first. He started with Foolish Burial, dumping Salamangreat Spinny from the Deck to the Graveyard. He Normal Summoned Lady Debug, using its effect to add Salamangreat Gazelle from his Deck to his hand. He sent Salamangreat Gazelle to the Graveyard to Link Summon Salamangreat Baelynx. He used Balelynx’s effect to add Salamangreat Sanctuary from his Deck to his hand which was activated to the field. He then used Sanctuary’s effect to Link Summon another Balelynx! He then used Gazelle’s effect to Special Summon itself and sent Salamangreat Roar from his Deck to the Graveyard. He then Special Summoned Spinny with its own effect from the Graveyard and used both monsters to Xyz Summon Salamangreat Miragestallio. Salamangreat Miragestallio’s effect let Lee Special Summon Salamangreat Jack Jaguar from the Deck. He then used Balelynx and Salamangreat Jack Jaguar to Link Summon Salamangreat Sunlight Wolf. He then used Salamangreat Jack Jaguar and Salamangreat Sunlight Wolf to Link Summon another Sunlight Wolf whose effect let Lee add Salamangreat Roar from his Graveyard back to his hand. He Set 2 to the back and passed. Barton started his turn by Special Summoning Cockadoodledoo which made it Level 3, a good strategy in a Phantom Knights Deck. He Set 2 cards to the backrow then passed. In the End Phase, Lee activated Salamangreat Rage, destroying Barton’s Set The Phantom Knights of Lost Vambrace and Phantom Knights’ Fog Blade. Lee Normal Summoned Salamangreat Gazelle and used its effect to send Will of the Salamangreat from the Deck to the Graveyard. He then used Salamangreat Sunlight Wolf’s effect to add Will from the Graveyard back to his hand. He then used Salamangreat Miragestallio’s effect, Special Summoning Salamangreat Falco from his Deck. Lee then sent Mirage and Sunlight Wolf to the Graveyard Link Summon Salamangreat Heatleo. Mirage’s effect sent Barton’s Cockadoodledoo back to Barton’s hand. He then used Salamangreat Falco and Salamangreat Gazelle to Link Summon Update Jammer then Lee activated Will of the Salamangreat. He then used Sanctuary’s effect to Link Summon another Heatleo using just the first one. He then used Will’s effect, sending it to the Graveyard to Special Summon Salamangreat Miragestallio, Sunlight Wolf and Falco from the Graveyard. Spinny’s effect Special Summoned itself out of the Graveyard and then Lee used Heatleo’s effect to give Spinny the ATK of the Heatleo in the Graveyard. All of Lee’s monsters attacked for game, a decisive end to the first Duel. Barton elected to go first. He started off with a Set Time Thief Flyback, then Set Time Thief Bezel Ship and passed. Lee activated Twin Twisters, discarding Salamangreat Spinny destroying Barton’s Set Time Thief Flyback, then activated Salamangreat Circle to add Salamangreat Gazelle. Lee then Normal Summoned Gazelle and sent Fusion of Fire from the Deck to the Graveyard. Then Salamangreat Spinny’s effect let it hop out of the Graveyard, then both monsters were used to Xyz Summon Salamangreat Miragestallio. Mirage’s effect Special Summoned Salamangreat Jack Jaguar from Lee’s Deck. He used the two monsters to Link Summon Salamangreat Sunlight Wolf. He then used Jaguar’s effect from the GY, sending Salamangreat Miragestallio back to the Deck from the Graveyard to Special Summon Jack Jaguar from the Graveyard. He then sent both monsters to the Graveyard to Link Summon another Sunlight Wolf, using its effect to add Fusion of Fire to his hand. Sunlight Wolf attacked into Barton’s Set Time Thief Bezel Ship, Lee taking 200 damage from Bezel Ship’s 2000 DEF. Barton drew The Phantom Knights of Shade Brigandine. He Set it then Normal Summoned another Time Thief Bezel Ship. He used the two monsters to Xyz Summon Dark Rebellion Xyz Dragon. He used its effect to make Lee’s Sunlight Wolf lose half its ATK and Dark Rebellion Xyz Dragon gain that much. He then attacked for 2500 damage. Lee Normal Summoned Salamangreat Spinny then used it to Link Summon Salamangreat Baelynx. Baelynx’s effect added Salamangreat Sanctuary from his Deck to his hand. He then used Jaguar’s effect to Special Summon it, then used both monsters to Link Summon Sunlight Wolf. He then used Salamangreat Spinny’s effect from the Graveyard to Special Summon it, then activated Salamangreat Sanctuary and sent Sunlight Wolf to the Graveyard to Link Summon another one with Salamangreat Sanctuary’s effect. He then activated Salamangreat Circle to add Salamangreat Fowl from his Deck to his hand. He then banished Salamangreat Spinny to Link Summon Salamangreat Baelynx. He then activated Fusion of Fire, sending Salamangreat Gazelle and Salamangreat Baelynx to Fusion Summon Salamangreat Violet Chimera. He then Link Summoned Salamangreat Heatleo and used the effect to shuffle Barton’s Set Trap back to the Deck. 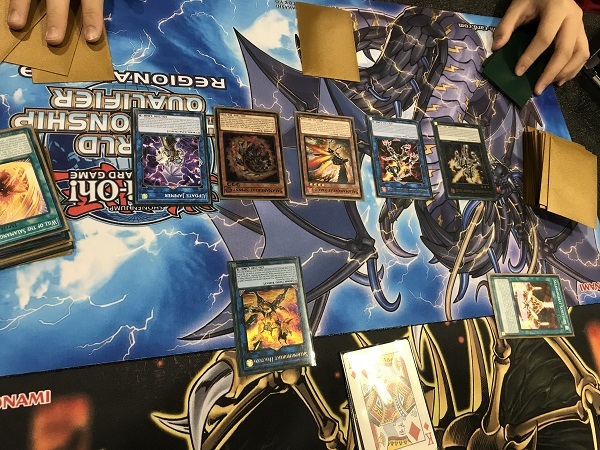 Salamangreat Violet Chimera attacked over Dark Rebellion Xyz Dragon and Heatleo attacked directly. Barton Set Phantom Knights’ Fog Blade and The Phantom Knights’ Rank-Up-Magic Launch and passed. Lee Normal Summoned Salamangreat Gazelle and used its effect to send Salamangreat Spinny whose effect was activated, Special Summoning it to the field. He used Sanctuary’s effect, using the Heatleo on the field as the only material for another Salamangreat Heatleo whose effect shuffled the Set The Phantom Knights’ Rank-Up-Magic Launch back to the Deck. When Violet Chimera attacked, Barton activated Fog Blade to stop the attack, but the rest of Lee’s monsters had enough ATK to end it anyway! Kenta Lee takes the third round undefeated!